Hello there! 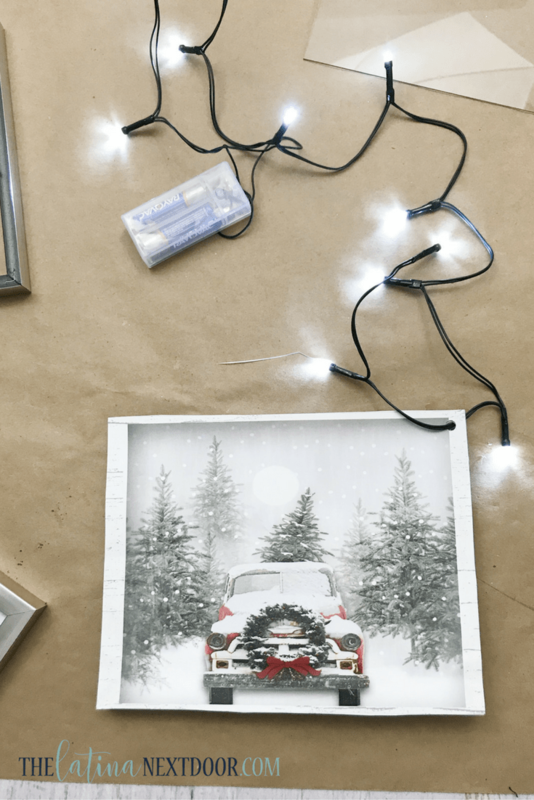 We are back at it today with Day 5 and for this day’s post we are sharing our Dollar Store crafts. You know love me some dollar stores, specifically Dollar Tree. I have already made several DIY decorations for Christmas and I decorated almost all of my Rustic Chic Christmas tree with their ornaments. Plus I just made the most ELEGANT candle holders EVER, you won’t believe! 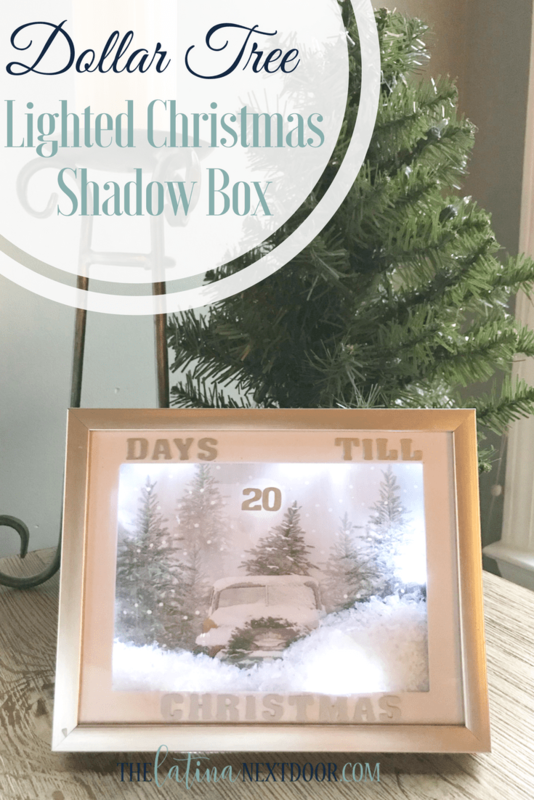 So this time I wanted to make a lighted shadow box that also acted as a Christmas countdown. Everything except the snow was bought at Dollar Tree and honestly it was because I had it leftover from my previous Dollar Tree project. First you want to remove everything from the frames. You are going to use one of the cardboard backs with the “standing tab” for this project. Cut out the gift bag the same size as the back so it fits inside the frame. 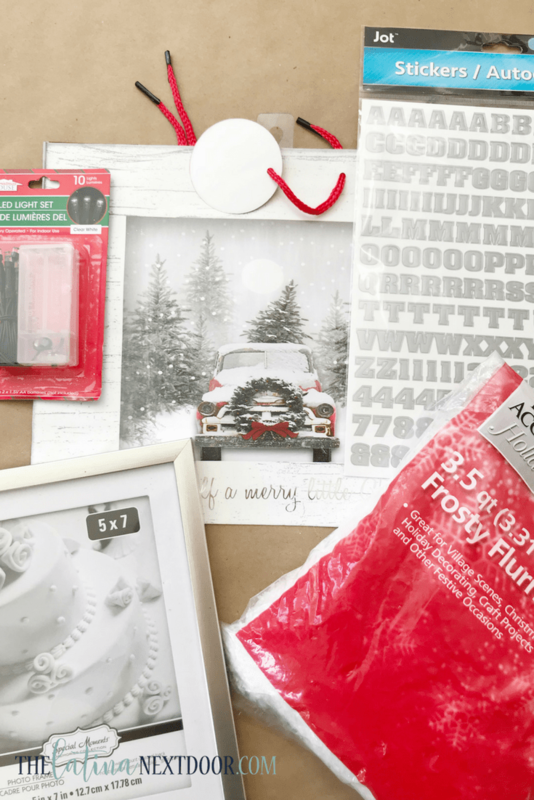 Adhere the gift bag art piece onto the back cardboard piece of the picture frame (you can use glue or double sided tape). Once you do this punch a hole at the top right corner and pull the LED lights through completely. 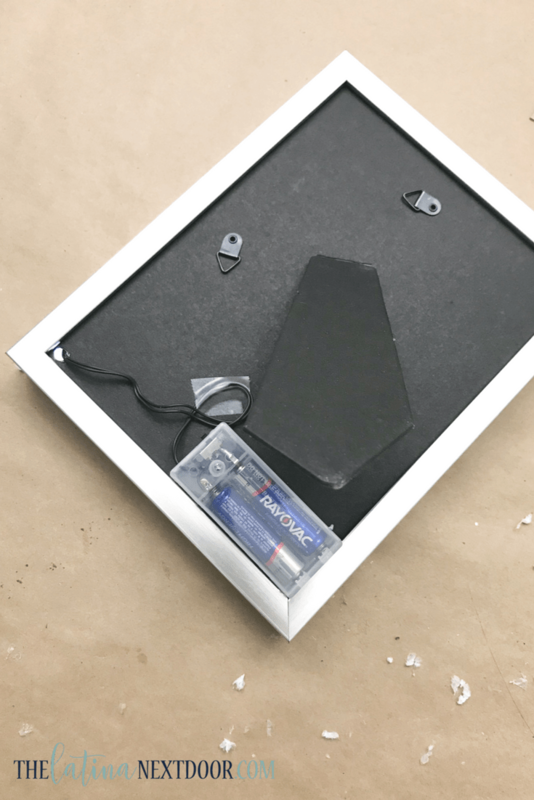 Then place the back into the frame (backwards) and adhere with E6000 glue. 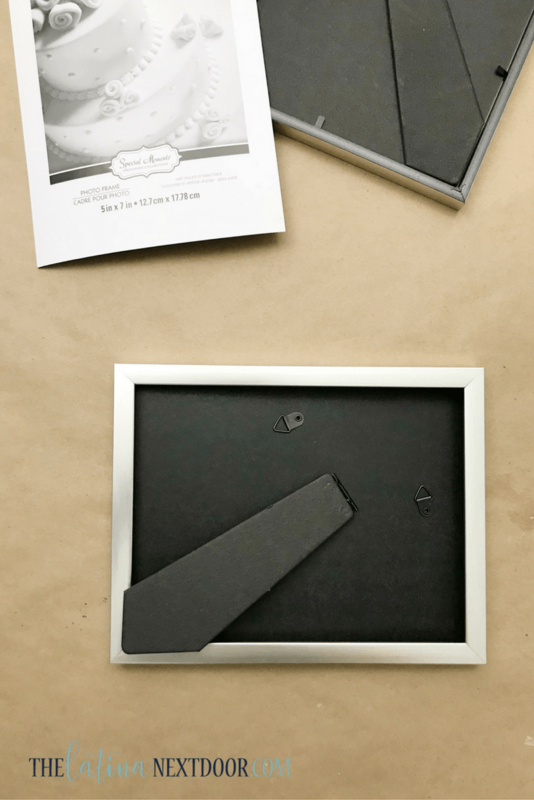 You want the tab to come out the nice side of the frame (how it was pictured in the first image above). 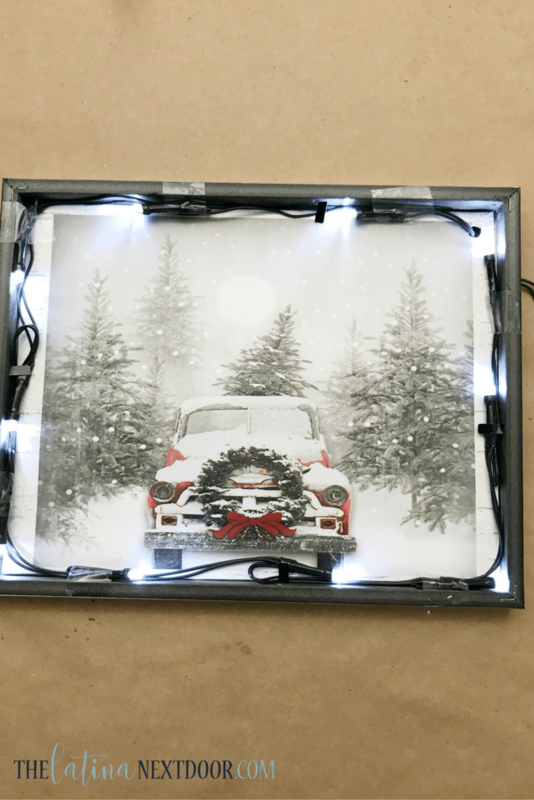 Using both the frame tabs and tape secure the lights to the outer boarder of the frame. Pull the excess cord out. 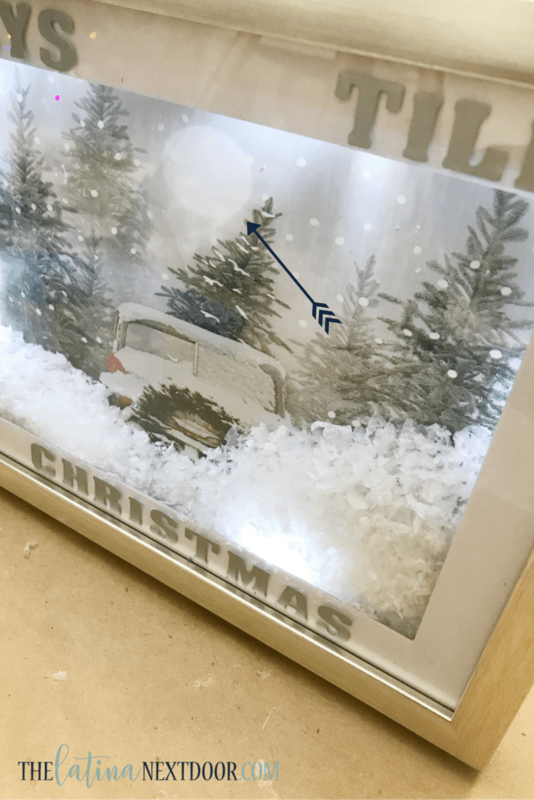 Add your fake snow (this optional but I wanted it to seem like the car was driving through snow). 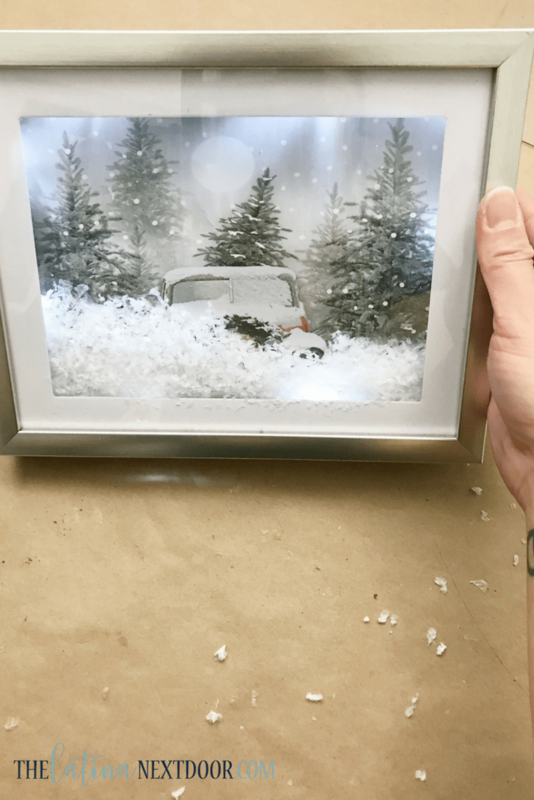 Then use the e6000 to glue the other frame onto this frame to seal in the snow and create the shadow box. You want to keep the mat board so that it covers the lights. Then just glue the battery pack and tape the cord to the back. You can definitely leave it like this. But since the art piece had a little moon (pointed out below), I thought I would use it as a countdown to Christmas. So I added some stickers and use the moon as my number placement. The kids love changing the stickers for me and counting down! And that’s it! This project cost me $5 and I love how it turned out. What do you think? 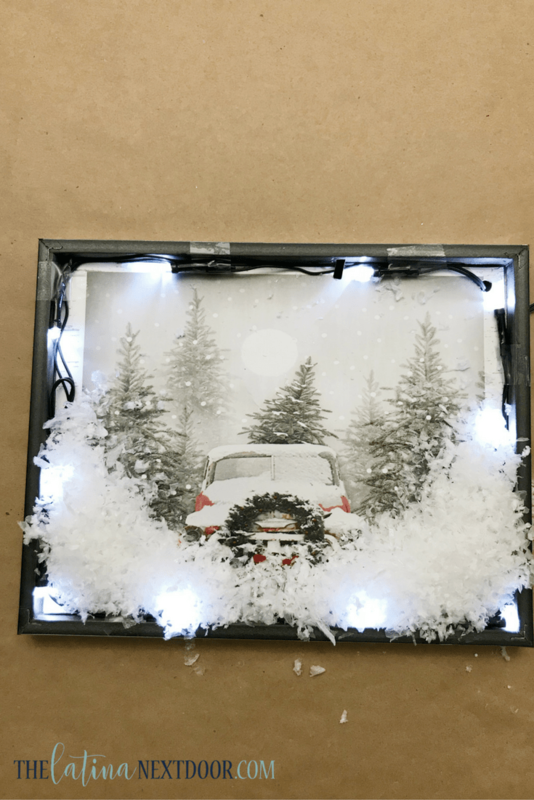 I have even more ideas to create my own shadow boxes now! So pretty and creative! I love it! This is adorable. I love the old trucks with the snow and wreaths. It reminds me of something out of a Hallmark Christmas move. Thank you! I figured with everyone using the old trucks in farmhouse decor this would be appropriate… and it does give a vintage feel that I love. Wow! You win for the most clever idea. Truly beautiful. Aw, thank you very much! I am so glad you liked this. It was a lot of fun to make and the kids love it. Wow, that is a really awesome idea!